Players from Scotland’s national rugby team have collaborated with Eden Mill distillery to create Scottish Rugby Milk Thistle Gin, the official gin of Scottish Rugby. The gin has been created by Stuart Hogg, Jonny Gray and Fraser Brown from the squad and features the flavours of cotton thistle and milk thistle, reflecting the Scottish Rugby logo, as well as juniper, black cardamom and spicy floral notes. 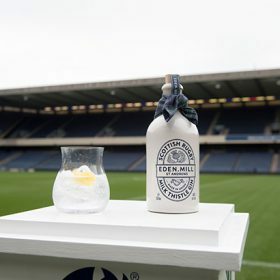 Paul Miller, co-founder of Eden Mill, said: “We know that Scottish Rugby fans also happen to be massive Scottish gin fans, with 50,000 Eden Mill gin and tonics expected to be served at Scotland, Glasgow Warriors and Edinburgh Rugby home games over the course of the season. The players visited St Andrews-based Eden Mill and its recently launched gin blending experience, Blendworks, where they began to identify botanicals to use in their gin. Black cardamom was a firm favourite, according to Miller, and it became essential to include this in the final recipe. Eden Mill entered into a four-year partnership with Scottish Rugby in August last year. The newly created Scottish Rugby Milk Thistle Gin will come in bespoke bottles that include an artistic impression of the Scottish Rugby logo as well as a Scottish Rugby tartan topper. The gin is priced at £32.50 (US$42) for a 500ml bottle and is available online now, as well as from the distillery’s onsite shop.